For more than 100 years, three generations of Menger doctors have specialized in “modern” eye care in the New York area. The meaning of “modern” has changed, especially in the last few years with the addition of microsurgery, lens implantation, refractive surgery, and laser treatments. These techniques require increasing skill and specialized training on the part of the doctor and result in a greater success and comfort for the patient. Louis C. Menger, MD graduated from Long Island College Hospital Medical School in 1910. He practiced Eye, Ear, Nose and Throat in Brooklyn until 1948. During his years in practice Dr. Louis Menger pursued post-graduate training at Bellevue Hospital and the University of Pennsylvania. Harold C. Menger, MD completed his undergraduate education at the University of Pennsylvania and received his medical degree from the Long Island College of Medicine in 1947. He completed his residency in Eye, Ear, Nose and Throat at New York Polyclinic Hospital and Medical School in Manhattan. He pursued his father’s specialty, practicing in Brooklyn and Queens from 1951 to 2002. Peter L. Menger, MD was the third generation of his family to graduate from SUNY Downstate Medical College in 1984. He interned at Overlook Hospital in Summit New Jersey and did his ophthalmology residency from 1985 to 1988 at The Manhattan Eye, Ear and Throat Hospital where he was appointed chief resident and was awarded the Surgeon’s Director’s Prize in 1988. Currently, he is on staff at Manhattan Eye, Ear and Throat Hospital as well as North Shore University Hospital and Winthrop University Hospital. 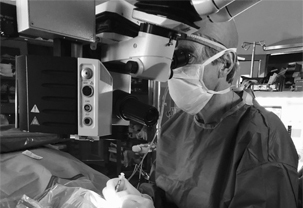 He is chief of Ophthalmology at the Queens SurgiCenter and is on the board of the new North Queens Surgical Center.